The diving boards we carry are made by S.R. Smith and Interfab. These two manufacturers offer a variety of residential and commercial diving board options. The main factors when considering a board is the size and the amount of spring. For safety, the manufacturer will recommend a diving board based on your pool size. They can help you calculate the minimum "diving envelope" (water depth) and proper board size for your particular pool. We recommend contacting the manufacturer of the board you are considering to be sure it will work with your pool. epoxy kit A complete diving board package includes a board, a base and related hardware for installation. Part of that hardware is the jig which is set in the concrete of your pool deck. The base then attaches to the jig and the board is bolted to the base. Many customers want to know if they can install a board and base in their existing concrete deck. The answer is yes but this requires drilling into the deck and using a SR Smith epoxy kit. The same would hold true if you are replacing an old board and base and the original jig is not in adequate condition to be used again. The old bolts would be sawed flush with the deck and the new ones would have to be positioned so as to avoid the original bolts. Some people are looking to just replace the board and attach a new one to their existing base. 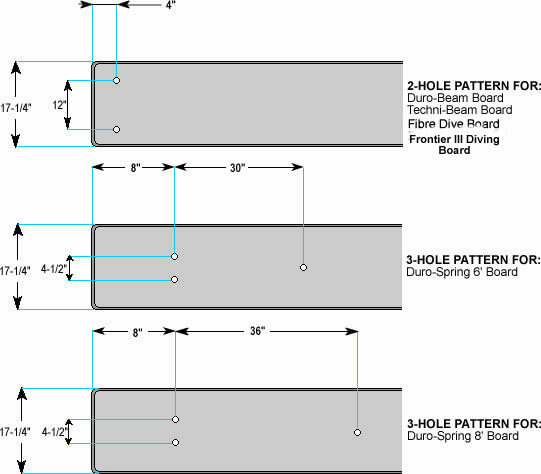 The best way to do this is to match the bolt pattern (see our diagram below for our Interfab boards). If this is not possible, you can purchase a board without pre-drilled holes so that you can drill the holes to match your base. However it is worth noting that these boards are not covered under warranty by the manufacturer. Each residential diving board will require a minimum area of deck space based on the size of the board and base. A typical minimum is a concrete pad around 8' x 4' x 6'. Diving stands have to meet with local government codes so it's a good idea to check on this before purchasing. Manufacturers also set minimum unobstructed headroom from the top of the diving board. Diving boards must be placed at deep end of the pool at centerline. The jig should be set in concrete in accordance with the manufacturer's instructions. Before pouring concrete around jig, check the jig bolt pattern for any misalignment that might have occurred during shipping. Refer to instructions to make sure that the bolts project out of concrete enough and have ample concrete depth below jig. When the finishing deck surface, it is critical to maintain a level surface where the jig bolts project out. This is so that the stand will make uniform contact with the deck when it's placed over the jig. Before mounting the stand, chisel away any excess concrete that may have built up around jig bolts. If there are bolt caps, remove them before placing the stand over the jig bolts and secure according to manufacturer's instructions. Secure the diving board to the stand according to their instructions, making sure the top surface of the diving board is level from side to side. Manufacturers typically follow ANSI (American National Standards Institute) standards for the installation of diving boards. In some cases, local code might exceed these standards so we definitely recommend checking with your local government. You can request a copy of the complete ANSI standards for residential in-ground swimming pools by contacting the Association of Pool & Spa Professionals at 703-838-0083 or www.nspi.org.